This is a report from SMX East 2016. Search Marketing Expo (SMX) features speakers from industry-leading digital marketers and search engine representatives. Subscribe to the BCI Blog to get coverage of key sessions sent to your inbox. Want to earn Featured Snippets in Google Search? 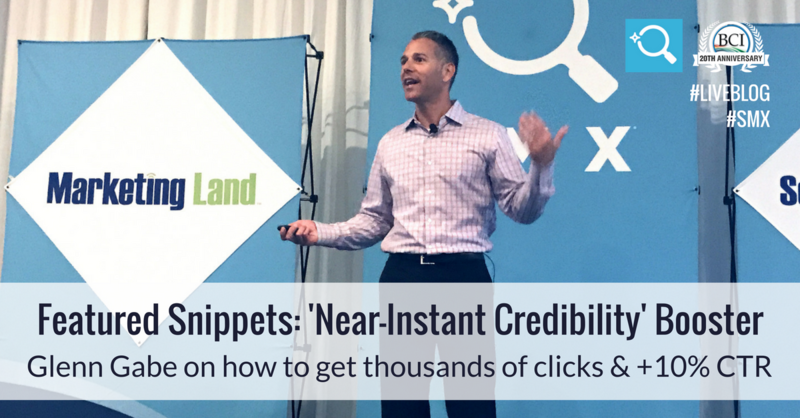 Glenn Gabe, the president of G-Squared Interactive, shares how to increase your chances of earning a Featured Snippet at SMX East. A word of warning, though: the Google algorithm can be fickle when it comes to Featured Snippets. A different client Gabe had earned a Featured Snippet, but then lost it … along with 39,000 clicks within a two week period. The client then won the Featured Snippet, and then lost it again, proving Gabe’s point about Google’s fickleness. Do you need to rank No. 1 to receive a Featured Snippet? No! But always Page No. 1. Are they displayed just for “question” queries? No. They appear for head terms and topics, as well. 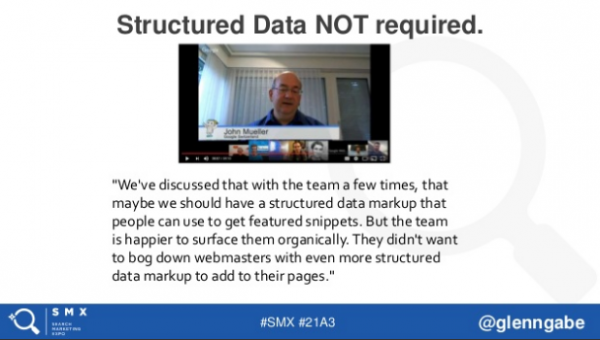 Is Structured Data a requirement? No. Though John Mueller’s team once considered making this a requirement, they decided against it. They didn’t want to bog down webmasters with even more code. Can Featured Snippets be personalized? Yes, depending on whether or not you’re logged in, your location, and your search history. What are some tools to find and/or research Featured Snippets? Google Search Console, SEMRush and Moz. Is there something even better than Featured Snippets? Yes: the huge SERP real estate winner that is a Featured Video. Can you refine Featured Snippets? Yes. And it works fast. Gabe did this and saw his result change in seven minutes. 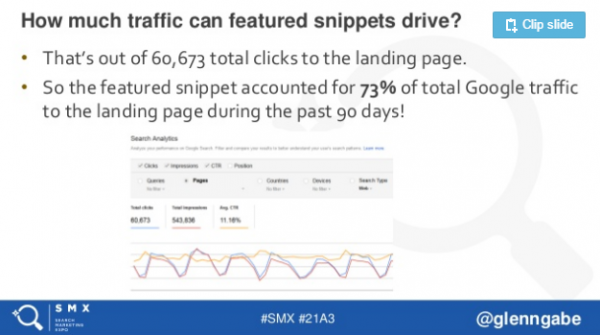 He reminds digital marketers to be careful, though – you could lose your Featured Snippet in the process. Cover a topic as thoroughly and clearly as you can. Answer the question concisely and provide both the question and answer on the page. Provide a concise section that answers the core query. Use bullets or numbered lists for processes. Provide a strong image near the answer for possible inclusion in the Featured Snippet. Use HTML tables where appropriate. Bruce Clay, Inc. is a global digital marketing agency specializing in SEO services, SEM PPC, content development and social media marketing. Looking for a partner to grow your online business presence? Let’s talk. Superbly written and well explained. Lots of things learned regarding earning money from this article. Thanks for your article.